The real question everyone should be discussing in Egypt is not who will win the next elections: but how will the situation in Egypt withstand such a precarious regime? All Sisi has is his gun. Morsi supporters rally to highlight plight of political prisoners. Demotix/Dave Evans. All rights reserved. In Egypt, things are not as they first appear on the surface. Take schooling for example; free education is a right supposedly guaranteed by the constitution for all Egyptians. Yet, you will find an overwhelming number of Egyptian students undertaking expensive private tuition to make up for the abysmal education they receive in state schools. These pretences are not solely confined to the education sector. The Egyptian judiciary, often touted as an 'independent' body by the majority of Egyptian officials, recently hit the headlines for sentencing hundreds of individuals to death in what international human rights organisations have condemned as a sham trial. These ludicrous sentences were issued by the same judiciary that has seen fit to imprison thousands of innocent citizens, including activists and journalists, accusing them of committing the heinous crime of protesting whilst officers, accused of killing protesters, are acquitted of all charges. 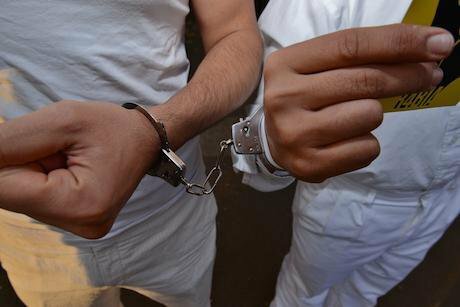 The most common phrase you hear about the police in Egypt is “the police is in the service of the people.” But it seems that the only services they provide come in the form of routine torture of detained citizens in every police station across Egypt. The list of fakery goes on and is promoted, not only by Egyptian officials, but internationally as well. John Kerry, the US secretary of state stated that the army is restoring democracy in Egypt, “And the military did not take over, to the best of our judgement - so far. To run the country, there's a civilian government. In effect, they were restoring democracy” said Kerry in a television interview last August. The British minister of foreign affairs, William Hague, at least expressed concern over the closure of political space - (as if political space had ever existed in Egypt to begin with). This paradox applies most fittingly to the coming presidential elections, where the former minister of defence and champion of last July’s coup, General Abdel Fatah El Sisi is competing against the leftist politician, Hamdeen Sabbahi, who also supported the coup that ousted the first elected civilian president of Egypt. With election day nearing, it is interesting to note the amount of attention being given by both local and international media outlets to the programmes of each candidate, analysing their chances, ideas, and campaigns, as if a genuine election were taking place. Yet as with all the previous artifices, the word 'election' is devoid of any meaning in relation to Egypt’s current political context. This is not an election, it is a sham, a tool to provide the General with a deceptive aura of legitimisation. There is no point in spending any time following news regarding the events or the turnout for this so-called election, because the results are known to all. In fact, the results have been clear since last year's coup, which brought the General and his military establishment to power. Despite several failed endeavours to portray the interim government as civilian, by exploiting prominent civilian figures and using them as tokens, it became glaringly obvious that this cosmetic make over was nothing more than an attempt to make the coup palatable to the international community. The real power lay in the hands of the military who soon reinstated the oligarchs and handed back power to corrupt Mubarak-era figures. Nothing will change in Egypt after the ascension of Sisi to power except that the puppet master working behind the scenes will now take centre stage. However, if there is one beneficial outcome from this theatrical electoral campaign, it is the fact that it has forced the General to reveal more about himself. From the various interviews and questions (despite avoiding live confrontational interviews and tricky questions), it is not hard to discern the nature and the style of governing employed by Sisi to rule Egypt, which he has been doing since the coup. Like any third world General, deficient in vision and culture, Sisi will use the only thing he knows to rule Egypt…his gun. With no electoral programme or any clear vision about how to deal with the dire economic and political challenges facing the country, the General will use the security card both internally and externally. On the internal side, it is expected that the crackdown against the opposition, which extends from the Islamists to secular groups who initially supported the coup, will continue and that the so-called ‘war on terror’ will be used as a justification for the failure of the government to solve the core economic and political crises of Egypt. With a growing and defiant Anti-Coup movement, and the absence of any meaningful political process, the instability in Egypt is expected to worsen. On the external level, the security card will be used to convince the Gulf monarchies to pour even more billions into Egypt to eradicate the Muslim Brotherhood whom the princes and kings feel threatened by. The same card will be used by the General with the west, especially the US, to gain more financial and military support to counter the increasing insurgency and justify the heinous human rights violations being committed by the military regime in Egypt. The General and the military, to guarantee continual western support, may find themselves becoming more involved in external operations including involvement in Libya (Sisi himself claimed that NATO did not finish off the mission there) or in Gaza, where the media and Generals accuse the besieged strip of exporting terrorists and arms to Egypt. These operations, besides offering services to the west, will be utilised to solidify the picture of the "strong man" in the eyes of the Egyptian public, large sectors of whom have become increasingly despondent as they experienced the worsening conditions since the coup. Those expecting any genuine change after the elections will be sorely disappointed. However the attempts to reproduce the Mubarak regime are not expected to succeed any time soon despite the massive financial and political investments made both internally or internationally. Instead, the real question everyone should be discussing is not who will win the next elections? Rather, it is how the situation in Egypt can possibly evolve under such a precarious regime? A question that so far, has no answer.